When you help people, meet them where they are: Understand that their circumstances may be more difficult than yours but do not become lost within that or be overwhelmed with sadness. Be encouraged by what life has given you and that you are able to give back, be encouraged by the help that you provide, be encouraged by what you will learn, be encouraged by the loving memories you will share – smile, share, love, laugh, and grow. I met Emma the Founder, President, and Nurse of Jungle Aid a few weeks ago in Hua-Hin with the Bangkok Volunteers Meetup group that I am a part of (previous blog post https://gettingtoknowtheworld.com/2013/01/13/1698/). Jungle Aid provides medical care to the Karen people refugees from Myanmar that live in the jungles of Thailand. On January 26th I joined Jungle Aid (Emma and Maria) and 5 other volunteers to meet and help the Karen People of Bon Luk village in Keang Kra Chan National Park (approximately a 5 hour drive from Hua-Hin where we left from). Bon Luk village is the most remote village that Jungle Aid helps but we got there virtually 100% by SUVs, with the exception of a 15 minute walk. Approximately 500 people live in the village with minimal access to health care (there is a small clinic near by), they have some electricity via solar panels brought in by “The Queen’s Project” (the only electricity I saw it in use was for fans in their weaving shop), and most of the homes are small structures made of bamboo. The journey to Bon Luk Village was quite beautiful. We rode the jungle to get there so as you can imagine there were plenty of tropical plants and amazing views from every angle. Luckily we were in a 4 wheel drive vehicle because there were some roller coaster like moments on the unpaved road. 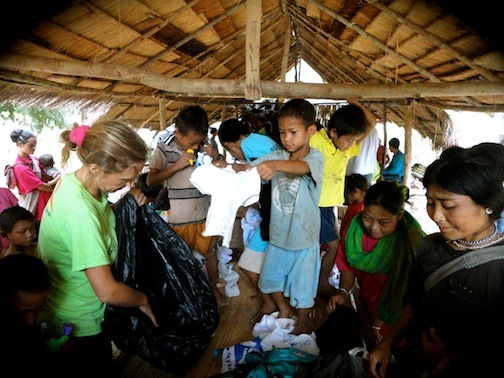 When we arrived we parked the cars and quickly ate our lunch that we brought with us, and took a about a 15 minute walk across a bridge and into the village carrying medical supplies, tooth brushes clothes, toys, paper, and crayons. We met the community members under a large pavilion and got to work. OK your temperature looks pretty good. Emma and Subatra (Suba, is another volunteer and friend that is a doctor) saw patients and I assisted them by logging the patients information (name, age, condition, medication given, follow-up needed); a group of 3 volunteers conducted a survey of the village, assessing how many people lived there, what the living conditions were, their overall health, education, etc…; and the other volunteers played with the children, taught the kids how to use the toothbrushes, and gave out the toys and clothing. Most of the people that Emma and Suba saw had worm infestations which is more than likely due to poor hygiene, luckily Jungle Aid had a large supply of medicine to get rid of the worms. There was also a cold that was going around and they were given vitamin C, and paracetamol (Tylenol) to help with that. Most of the women worked at the “Queen’s Project’s” weaving shop and suffered from back and shoulder pains due to working in the same position for hours, Emma gave them a menthol rub to use and suggested that they take breaks to stretch. One person was believed to have tuberculosis, there was a child with asthma, a man with an unknown growth on his foot that needed to be drained, a woman who had an unknown illness on her nose that hurt and bled, and a little girl who had abscesses on her head. I had the pleasure of meeting this precious little girl and giving my first hair cut to her- she had several abscesses on her head so her hair needed to be cut, the boils were medicated, and her mom was taught how to clean her. Some of the patients had been sick for months or years and had not even gone to the clinic that is near by. Jungle Aid provides an invaluable service of direct health care and also follows-up with patients that may need additional care at a hospital by bringing them to the hospital and paying for their treatment. Not only does Jungle Aid provide medical care but more importantly they let the Karen people know that others care about them. The team that assessed the village told us that about 80% of the children attend school; they do not currently record information about births, deaths, health, etc…; the women that work in the weaving shop earn 100 BHT a day and get a commission of 1,000- 3,000 BHT depending on the item sold; there is a small store in the village; 9 of the 10 out house toilets were in decent condition – ceramic squatting toilets with decent sewage system that did not drain into the river, 1 was a whole in the ground; there is a malaria health worker in the area that visits various villages to diagnose and treat malaria, they are allowed to grow eggplants which is provided by the Queens Project but they are not allowed to grow other plants or to keep animals; they do not always have enough rice for everyone to eat. Jungle Aid will use the assessment to determine future donations needed and other ways to sustainably aid the community. Overall I had an amazing experience, it was an amazing opportunity to learn (I have an interest in health care), I met wonderful people, and I got to have a glimpse of a different way of life. 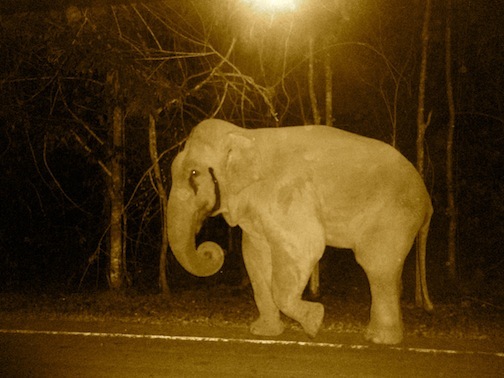 And a bonus, on our ride back we rode through “Elephant Country” and saw three massive wild elephants! I am looking forward to volunteering with Jungle Aid again. Thank you to Emma and Maria for taking all of us along with you, to Celilu the organizer of the Bangkok Volunteers group for introducing us to Jungle Aid, to Khun Paron for providing the volunteers with a place to stay, and to all of the volunteers who took pictures. Mix together a 1/2 cup of Miami, 2/3 cup of Cancun (without the teenagers), and about a 1/3 cup of Jamaica and you have Boracay. Boracay is a beautiful and fun island in the Philippines with long stretches of beach with sand at the door steps of the hotels, mini clubs, restaurants, stores and bars; bamboo structures and farm animals (roosters and goats) sprinkled throughout the island just behind the beach; crystal clear water with tropical fish and boats floating about. 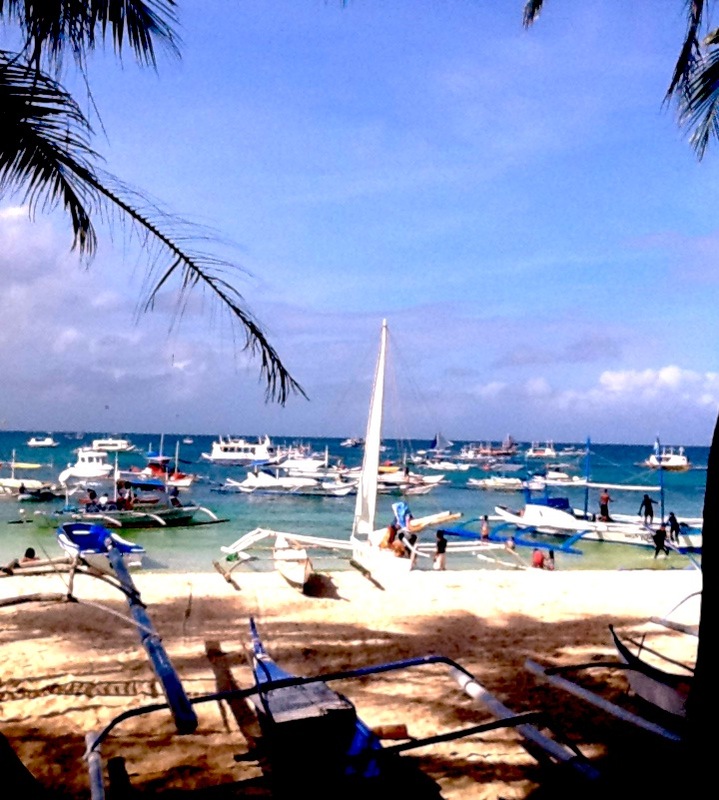 Boracay is a vibrant, energetic, island. There are tons of water sports to do there – we didn’t do any of them but they did look like fun. 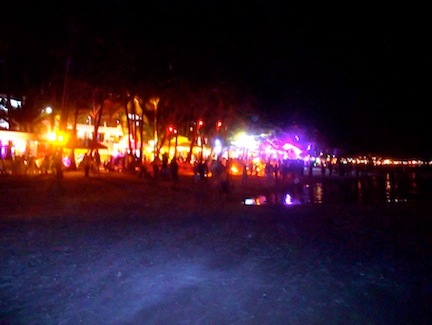 At night there are tons of restaurants to choose from and there are amazing fire shows given by lady boys and boy dancers all over the place. They really do provide a spectacular show. There are tents set up in front of the main buildings with food, drinks, and music as well. On Friday nights most of the restaurants will have buffets on the beach with a dinner show. The cover band at the restaurant we ate at had an amazing cover band. The lead singer even sang a Whitney Houston song pretty good and the crew (chefs and waiters) danced to Gangman Style. 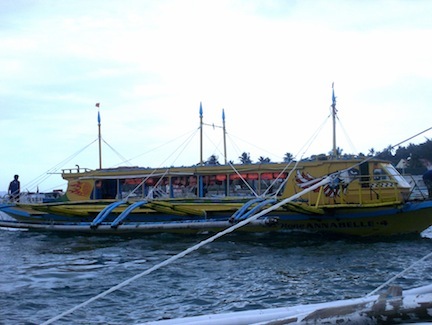 Getting to Boracay from Kalibo Airport is something that you can do on your own. A lot of tour companies and airlines sell tickets for the service of someone walking you through this process this is completely unnecessary. When you land at Kalibo Airport you will be greeted by a host of van, bus, and car companies that will offer you transportation to Catlican to take a ferry to Boracay. You then take about a 2 hour ride (unless the bus company you choose stops for 20 minutes at their rest stop store) to the Catlican ferry terminal. When you arrive there you will have to pay a terminal fee and an environmental fee although you purchased your ferry ticket through the land transportation provider that you just used. The ferry that everyone calls a ferry is actually a pump boat (there is one ferry there but I’ve never seen or heard of anyone using it). 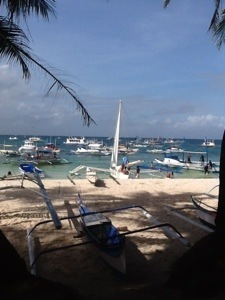 You get on the next available pump-boat and take a 15 minute ride to Boracay. Once you arrive you hire a tricycle to take you to your hotel and that’s it. It sounds like a lot of steps but it is honestly a very simple herd following process. While looking for activities in Boracay I found out about Tibiao, a place that most people including Filipinos have never heard of. 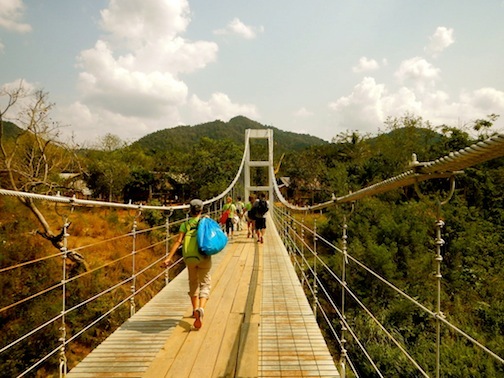 Tibiao is full of options for those with adventure in their hearts. 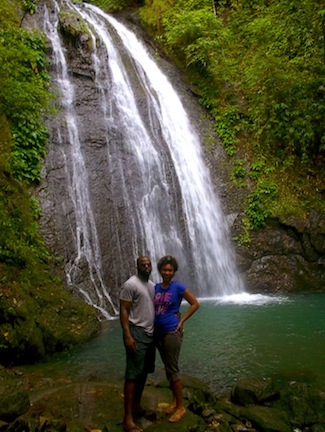 I booked a local guide in advance with Katahum Tours a locally owned and operated company. Using them I had to book my own transportation from Boracay but that provided a huge savings. The options we chose to do were: Waterfalls, Butong River swimming and diving, Kawa Hot Bath, Pottery and Brick Making, and Kayaking. Once we got to Tibiao Fish Spa we were picked up on motorcycles and headed to Bugtong-Bato a small village where you will pick up a local guide to trek the waterfalls (we did stop to pick up lunch once we arrived but there were just a few options so pack a lunch). So we were riding on the street and then there’s a turn and we are riding a motorcycle up a mountain on an unpaved road WHOA. Nothing happened we are ok but WHOA. After that we went kayaking and had an amazing time – keep rowing! After kayaking we were cooked in the Kawa Hot Bath, which pretty much is just a photo shot; it takes a long time to heat up and you’re sitting in smoke, once it heats up and the tub is cooled down it’s a cool 5-10 minute experience. 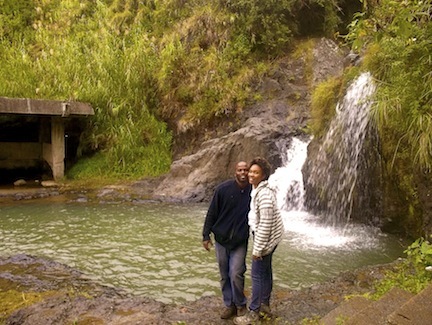 Since it rained the previous day we were only able to climb the waterfalls, take a Kawa Hot Bath, and go Kayaking. The extra water did make the white water kayaking a bit more fun! Ahhh the fish are attacking my feet! Who needs the beach shot when you can have a waterfall photo. 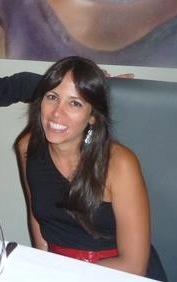 Rossigna, is one of my good friends from the wonderful city of Lima, Peru. I met her while attending a Lima Social Club Meetup at this amazing restaurant Manifiesto. Where do you live now, what is it like? I live at Magdalena in Lima _ Peru but I use to live near the beach at La Punta Callao. It’s a peninsula completely surrounded by beach. My father’s family is from La Punta. Where is your favorite place in Peru? My favorite place is La Punta were you ca see nice views, walk on the street next to the beach, eat good ceviche, and it is safe place. What is your favorite traditional Peruvian food? Where is your favorite place to visit to escape the city? A place where I love to go outside of Lima is Santa Eulalia, it is next to the mountains. What I like to do for fun is going out to bars and new restaurants. Also barbecuing. If someone were visiting Peru what are a few of the places they must go to? My favorite trip in Peru was to the Amazon jungle. I also enjoyed my trip to Vilca and Huancaya, magical places in the mountains were you can see very fantastic views of the nature like many blue ponds, blue magical sky, beautiful green nature, woods with lakes, big mountains…. it’s the best place i have ever been. It’s a little cold and high. Barranco – for a nice walk, to see the street ocean, and maybe to eat some Peruvian food. Visit La Punta Callao to see the Puerto, walk through the street and see the old houses parks and beautiful views of the peninsula. Paracas – to see the beach and take in the view and visit the island. Mancora – Las Pocitas, is a relaxing beach were you can rent a cheap house with a group of friends also the house come with a lady that cook really good. If you like adventure, you can hike near Lima there are groups for trekking that takes you to walk through the mountains for 1, 2 or 3 days the group’s name is Aire Puro. I used to hike and remember a 4 day trekking at Huaraz, cold but with really beautiful views like the big Cordillera Blanca and Black Cordillera, the beautiful blue sky and ponds, also there is the Callejon the Huaylas were their culture and food is really good. The country I would love to travel is Thailand, I would love to learn about their culture, food, people, religion, etc. For me that’s the next country I must visit. What should people know about Peruvians? What I love about Peruvians is that we love when a tourist come to visit us and learn about our culture. Usually we are really friendly. Margaux is a Filipino that grew up in America, a good friend of my friend Cynthia, an artist, and one of the fabulous diva’s of The Powder Room. She helped me out by sending me an amazing list of to sees and dos while in Manila. Where is your hometown, what is it like? I grew up in California but I’m proud to say I have found home here. I stay in south Metro-Manila. A city called Paranaque. The same city the airport is in. Just like almost every other city, it has its dodgy areas as well as some real nice spots as well. The area where I live has a lot of restaurants and shops near by so it’s real convenient. 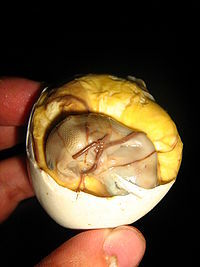 Plus, you can hear a guy yelling “Taho!” every morning, and guys selling balut (fertilized duck embryo– YUMM) every once in a while in the afternoon – no mistaking I’m in the motherland. Where is your favorite place in the Philippines?I actually haven’t been to too many places, but I do have quite a beautiful romance with Boracay. Somehow every time I go, I manage to sit on the shore, look up and stare at the stars and realize what paradise feels like. What is your favorite traditional Filipino food? I have so many! 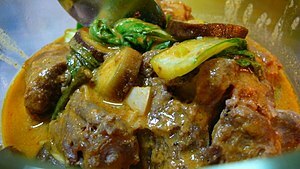 I’ll say Kare Kare because I just ate it last night and it’s not as well-known as some others (Adobo or Sinigang and of course, Lumpia). But it’s a peanut based stew sort of dish. Original recipe calls for tripe but I don’t eat that. Haha. What’s the most interesting thing you’ve seen in the Philippines? 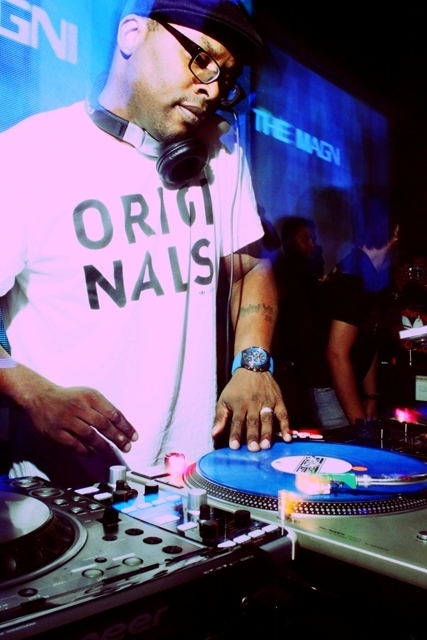 It’s not Filipino but seeing DJ Jazzy Jeff spin at a club here was amazing. Just because I never thought someone I had been listening to and watching on TV since I was a kid would be out here. What should people know about Filipinos? We’re a very hospitable and friendly group of people for the most part And just because there were tough times in a country’s history (we aren’t the only ones) where they had to resort to a certain way of living, doesn’t mean we eat dog. – Check a show – I believe The King & I is running.. and there is a live magician show as well? 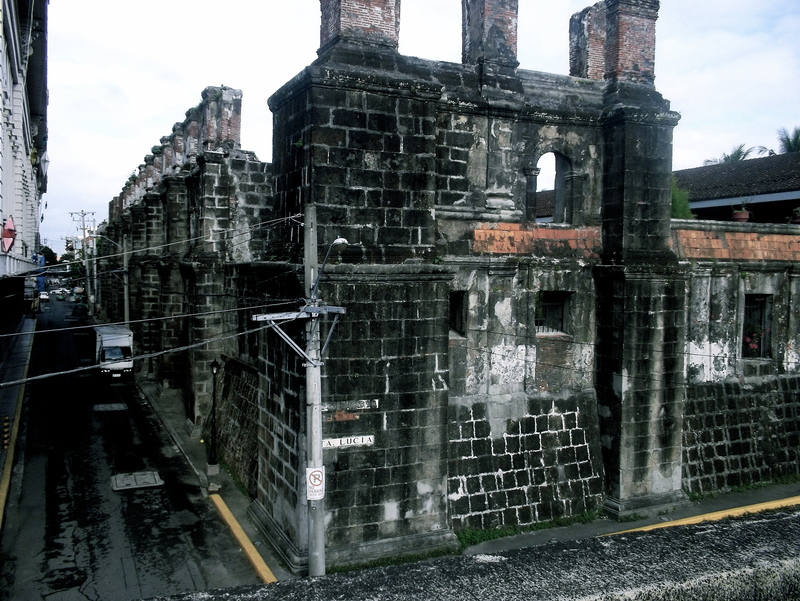 – Walking tour of Intramuros with Carlos Celdran – http://celdrantours.blogspot.com/ I believe right now, he’s doing it accompanied with Gabe Mercado who is an improv comedian – should be good! – Ayala Museum – they usually have good talks there, especially their design talks but I don’t think one would be scheduled. Their exhibits have been nice as well. Lots of local shops and boutiques, as well as an art gallery at Secret Fresh (not sure if there is anything up there at the moment though). There little restos there too. – B-Side, where there is Boom Bap Fridays for the hip-hop heads and Irie Sundays for the reggae folks. – Organic/Natural material place called Ritual – they sell bath salts, natural cotton robes, organic shampoo, etc. – Vinyl on Vinyl – art, toys and music – they are a gallery as well. – Aracama is a nice spot where Embassy used to be and Prive is right next to it. And of course, malls which are sprinkled everywhere. 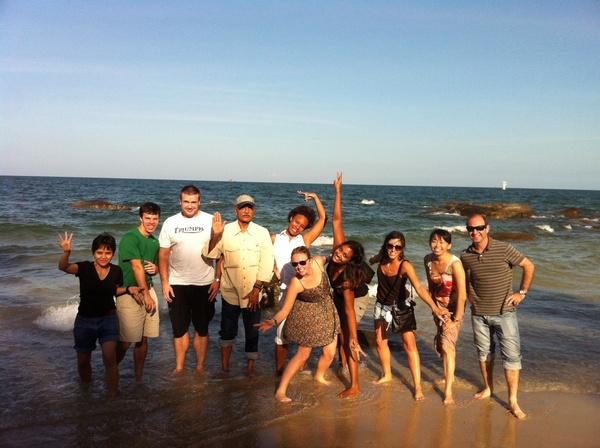 Yesterday I joined the “Bangkok Volunteers Group“ MeetUp.com group and it’s organizer Celilu on a trip to Hua Hin to meet Emma, the Founder of Jungle Aid. It was great way to spend the day with like-minded people and to learn more about the work that Emma and Jungle Aid does to support the Karen people who live in the Jungles of Thailand. 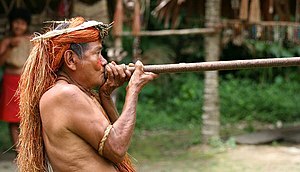 The Karen people who they support are a group of people that are refugees from Myanmar, that live in remote villages in the jungle that do not receive any outside help. They do not have access to basic medical care, education, and are denied the ability to grow their own crops or to keep animals so that they are able to eat. Jungle Aid supports these villages by providing medical support on a monthly basis, by helping them establish micro businesses such as producing and selling coconut oil, and is looking to assist them with education and setting up permanent medical clinics. h, if you would like to make a donation please feel free to paypal me at ericav.knowles@gmail.com prior to January 26th. If you don’t have a paypal account leave a comment below and I will contact you. If you live in Bangkok just contact me so we can get together. I’m starting a new series simply titled “Getting to Know the People,” where I will ask a few questions to some of the friends I gain while traveling about their country. I met Rico and his group of friends while traveling to Sagada in the The Philippines. They took Matthew and I in as part of their crew. He’s a funny guy that loves to travel. Where is your hometown, what is it like? Pasig City, we have a river running through it..
Where is your favorite place in the Philippines? HEHE, home is still where it’s at. 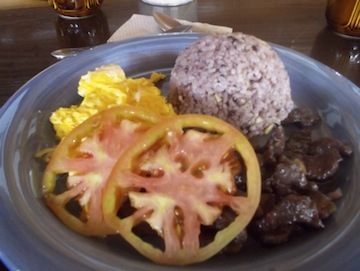 What is your favorite traditional Filipino food? Anilao, Batangas.. Dive spot.. It’s near the city but not crowded..
What is your favorite Filipino holiday and what do you do to celebrate it? 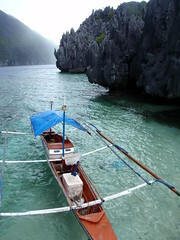 If someone were visiting the Philippines what are a few of the places they must go to? I’m super jealous he’s in Palawan that is another place I wanted to check out while I was there. What’s the most interesting thing you’ve seen in the Philippines? Wow, this is a hard one..
What should people know about Filipinos? HEHE THANKS FOR THE OPPORTUNITY TO SHARE!!! MORE POWER TO YOUR BLOG!!!! And tell Matt to steer clear of Monkey Brains.. Hehehe.. SEE YAH!!!! 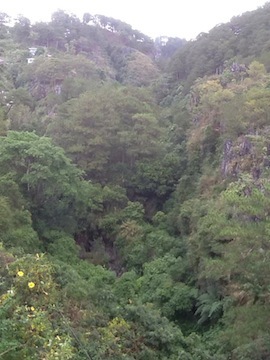 Sagada was a great experience. Matthew and I jumped back on the bus and this time we knew what to expect in the torturous ride so it wasn’t as bad. I found a somewhat comfortable position and since it wasn’t too late I stayed awake by playing a few games and reading a book I previously downloaded on my i-pad; although I wish I had wi-fi access so I could play an online game or something on a site like Binguez.es to distract myself from the 10 hours of remaining boredom. We reached Manila by 2am, saw a few cabs lined up and tried to get in one of them to hear Joseph our tour operator then say “I reserved taxis for the people who requested me too”. Apparently that wasn’t a group discussion and he didn’t think that the only two non-Filipino people that were with him might need a taxi. But it all worked out, Matthew was able to grab us a taxi off the street within a few minutes. We got back to the apartment to finally get some real sleep. 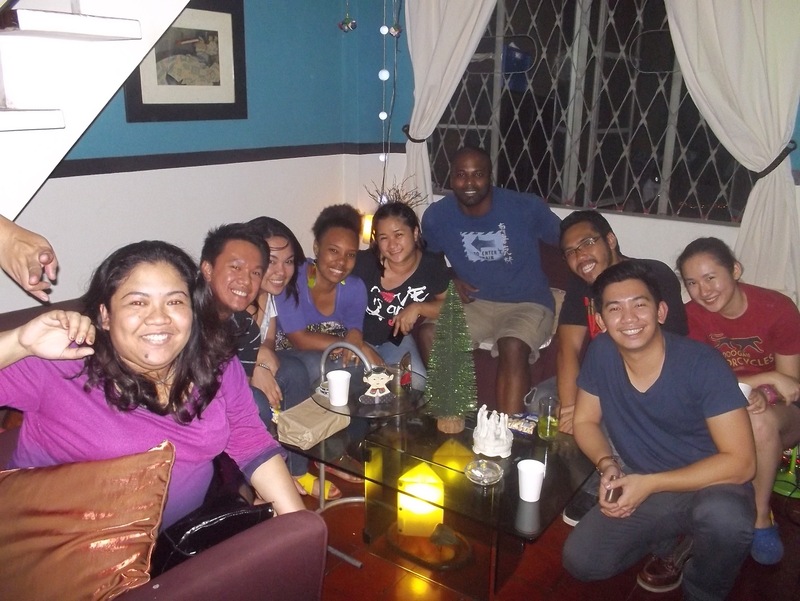 We were in Makati from December 30th – January 2nd. While we were there, Cynthia, Daniel and their baby Noa arrived so we went to a few of Cynthia and Daniel’s favorite restaurants. We also decided to check out a few places that Cynthia’s friend Margaux recommended. Legazpi Market market that is open in Makati on Sundays mornings and closes around 2pm. 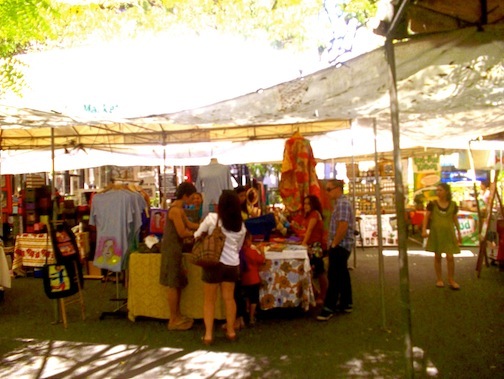 It’s a small market; however, it does have quite a variety of international food options, local artist, clothing, and crafts. We decided to try a Filipino “healthy” pork dish at Diana’s Special Bibingka in Legazpi Market. It was pretty tasty. 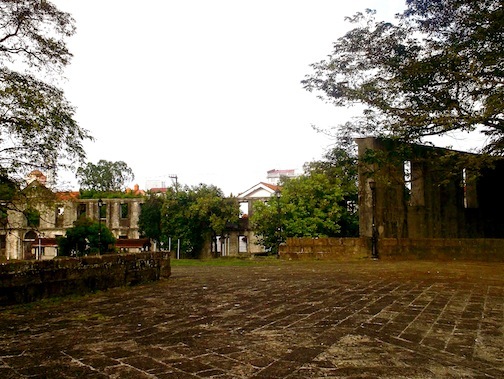 Intramuros is a colonial fort/city built in Manila when the Spaniards colonized the Philippines. It is a nice walk once you find the wall, which you can walk on top of. I call it “The Great Wall of Manila”. 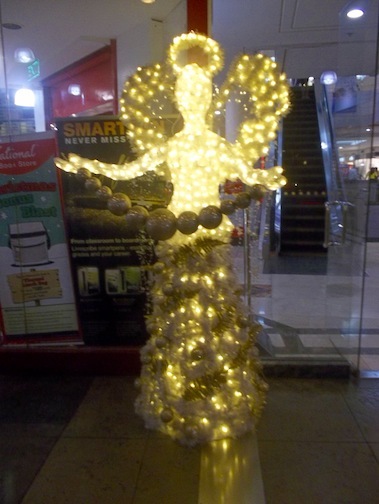 The spirit of Christmas was still in the air when we arrived back to Manila, so there were still tons of angels, trees, and Christmas lights all around. There are tons of Malls in Manila, quite a few of them are interconnected so you never have to step outside. We got a chance to visit quite a few of them including: Greenbelt 1 -5, Greenhills, SM Mall Makati, SM Mall of Asia (one of the largest malls in the world with one of the worlds largest 3D IMAX theater screens), Gloreita, The Fort (Bonifacio High Street), Market-Market, and Rockwell. My favorite was Greenbelt 1-5 for walking around, people watching and restaurants. SM Mall was the most crowded mall I have ever been too, it was pretty much overwhelming on New Year’s Day. I’ve never been to a city street countdown, I am glad that I had the opportunity to join the Pinoy’s of Makati for theirs. Their firework display was the most amazing one that I’ve ever seen. I’ve usually watched fireworks from a distance, these fireworks were just a few feet above us compared to other shows that I’ve seen. Here’s a video that I found on YouTube of the show we saw from the same view-point https://www.youtube.com/watch?v=6W_peoH5qNU. After that we headed to Rocket Room, where Daniel’s friend Edge was DJing to celebrate. 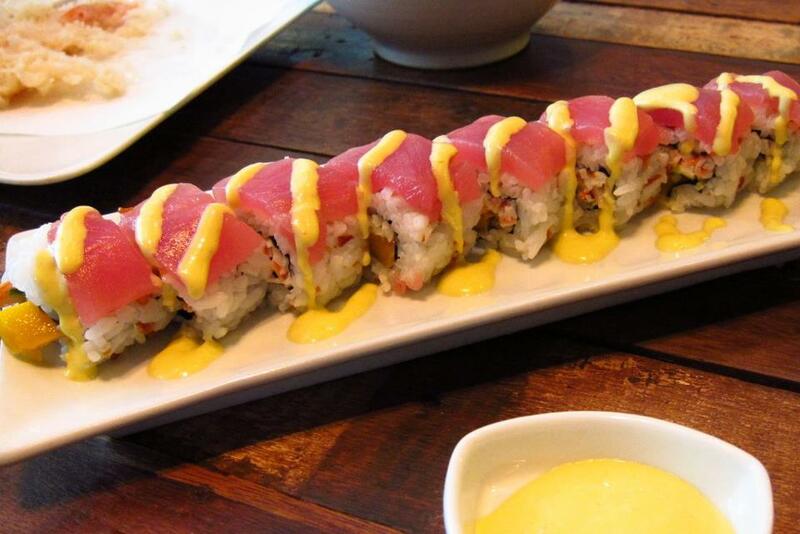 Manila Maki – nilasing na hipon with mango and kani salad in garlic sushi rice topped with fresh tuna and a special mango dressing. 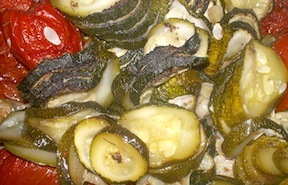 Manila is filled with an array of international food options. While there make sure you try some of the Filipino dishes such as adobo (which comes in a variety of styles based on regional flavors), sigsig (fried pig face), halo halo (dessert), and beef tips. Manila Maki- Filipino Japanese fusion restaurant with Sushi and meat eater options in Makati’s Salcedo Village district. To be continued – Part 3 Boracay …. I recently moved to Thailand to explore Asia. Every 3 months the school I work at has semester break, which allows us time to travel. A few months ago my friend Cynthia, who I met while living in Lima, Peru let me know that she and her family were going to the Philippines for vacation and asked if my husband Matthew and I would like to join them so we could all catch-up. 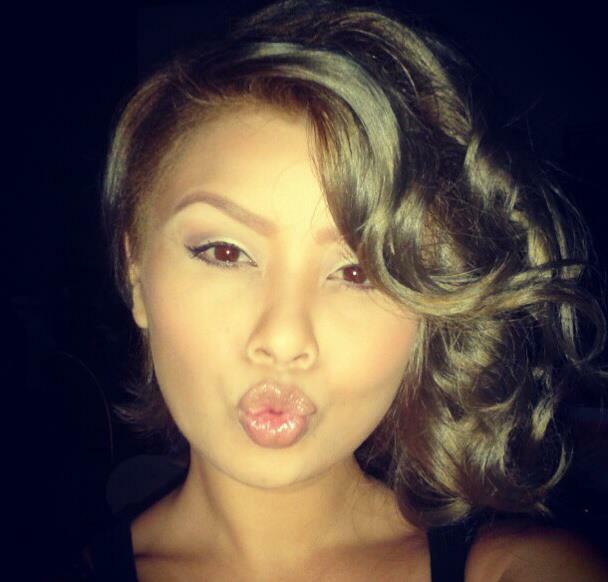 Cynthia is half Filipino and Austrian and lived in the Philippines during her young adult life. We missed our friends from Lima and realized that it’s rare to visit a country with a local and welcomed this as a great opportunity! So right away my research began to determine if and when we would go and which places of interest we would explore on this exciting visit. 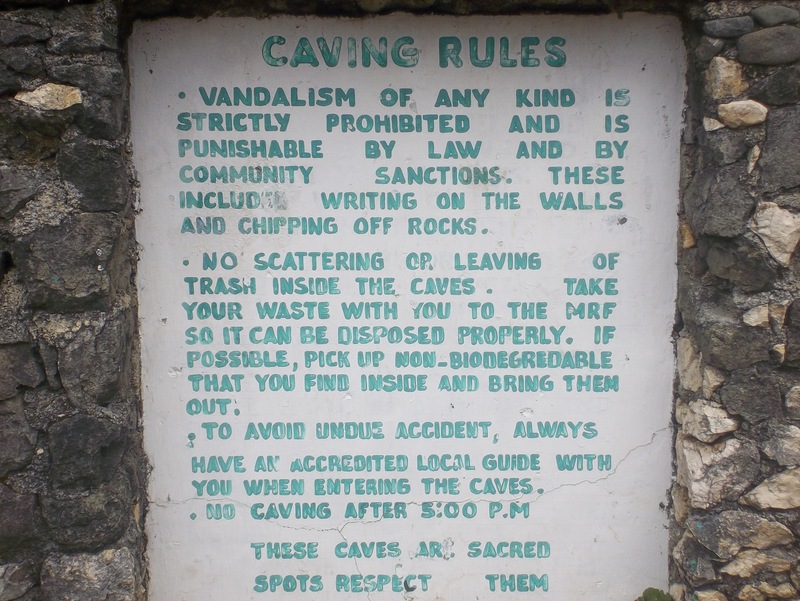 During my search I stumbled upon the town of Sagada, which provides the opportunity to go spelunking. 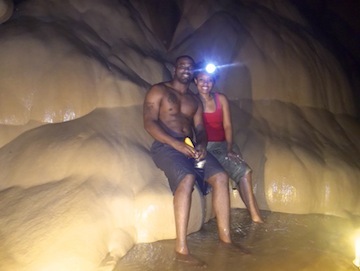 Matthew and I enjoyed spelunking when we visited the Actun Tunichil Muknal (ATM) cave in Belize. 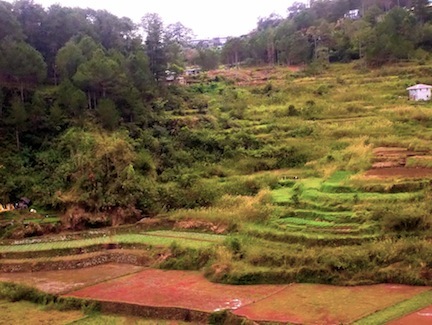 http://thetravellingdork.com/sagada-do-it-yourself-travel-guide-itinerary/ a website by a blogger. The only thing that needs to be updated on each of these sites is the bus company that you can take from Manila to Sagada via the Banaue route is Ohaymi Trans; however, they never responded to my email and I didn’t end up traveling with them in the long run. But while in Banaue I did see their bus. 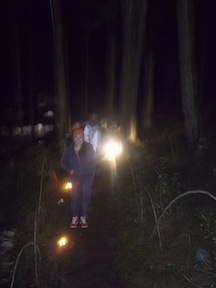 The planning ended up being more difficult than I expected because our trip was to take place during the peak season. I wanted to be there for SAGGAS (Sagada Genuine Guides Association) annual bonfire that I read about in the blogs mentioned. I phoned recommended hostels in the area; to my dismay not one had a vacancy. 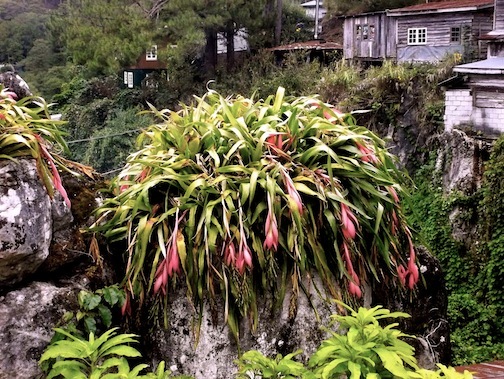 Finally while on the SAGGAS website which has a chat box someone let me know about DNA Travel, a tour company that had inclusive packages with rooms and transportation to Sagada. Eventually I booked with DNA but only for the room and transportation package. I found the inclusive tour to be overpriced. we able to get a room for the night of the bonfire. they were able to secure bonfire tickets for us. a great buffet dinner at the The Log Cabin (I understand reservations must be made well in advance for a place at this buffet). We arrived in Manila on Christmas morning to hear “Merry Christmas” from everyone we came across! This was very nice and a huge contrast from Bangkok which is majorly Buddhist but for some reason celebrates an artificial/commercial Christmas holiday with decorations and music in all the stores and malls without the true sentiments. While in Manila we stayed at our friend’s place in Makati which is a really nice section of Manila close to some of their best malls. Our friends hadn’t arrived yet so I logged on to couchsurfing.org to find some instant friends and something to do for the evening. We ended up meeting a Manila couch surfer at Greenbelt Mall, eating Filipino food at Kitchen (pretty good stuff), and then going to another’s house for an impromptu couch surfer Christmas party. 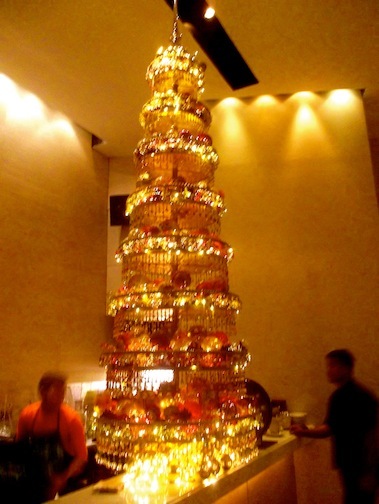 The host had actually hosted a Christmas Eve dinner before so there was food and drinks available for everyone. He made bacon from scratch, brined in salt and seasoned with basil among other things – it was delicious! While there, we spoke with a few people who had been to Sagada before, they gave us great recommendations; the restaurant and bar Kimchi and a definite -The Log Cabin’s buffet! The next day we were off to the SM Mall in Makati and Greenhills, which is a large mall/market similar to other Asian markets and the typical American flea market where you can price haggle. The good thing about shopping in Manila is that the prices are low and they have clothing in our sizes. In Manila I purchase medium size clothes, while in Bangkok sizes large and extra-large. 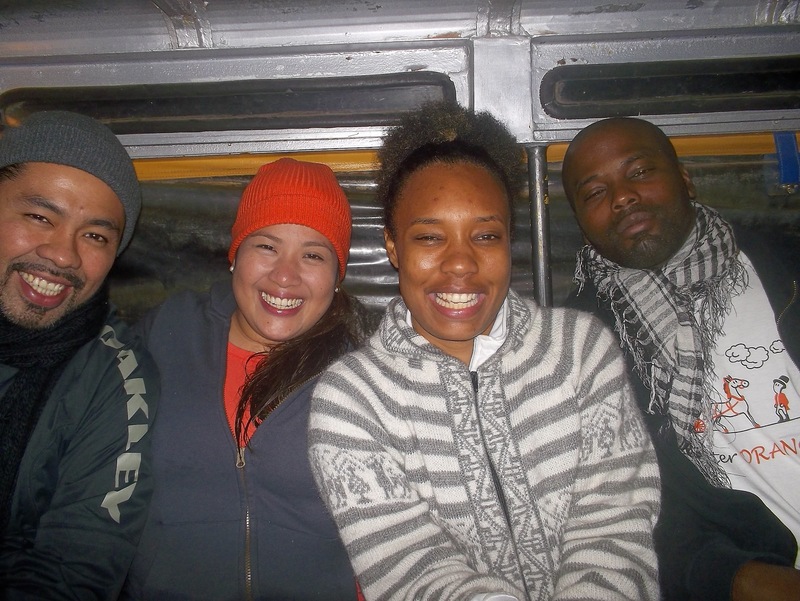 That evening we headed to Queszon City to board the bus to Sagada. We all met in a restaurant to wait for everyone to arrive and board the bus. THE BUS — what can I say about that bus? These were the smallest seats on any bus that I’ve ever been on. The seats were not made for Filipinos or westerners they were only for people from Asian countries like Thailand. Matthew filled up a seat and a half so this left me with the aisle arm rest down and pushed into my waste to prevent myself from falling out of my seat. On top of that the air conditioner only had an off or on setting – it was on and freezing cold Joseph forewarned us of the bus being cold so I had a blanket. Joseph, the organizer of the trip kept saying this was a charter bus so we could stop if we needed to. I spoke up and asked about the air- conditioner. For some reason it was understood that we could stop but controlling the air was not something he thought about being under his domain, thus I kindly asked the bus driver to turn off the air. Because we were then in the mountains and it was colder on the bus than it was outside. The bus driver turned off the air-conditioned for the remainder of the trip and it was a much more comfortable ride. I did inquire about the size of the seats and was told that the small bus was the only bus that could drive on the small town streets up to Sagada. It was decided to prevent changing buses a few times this small bus was the best option. Had I known this I would have gone with the latter option of changing buses; but I might have had a more difficult time getting the air-con (that’s what air-conditioners are called in Asia) turned off. 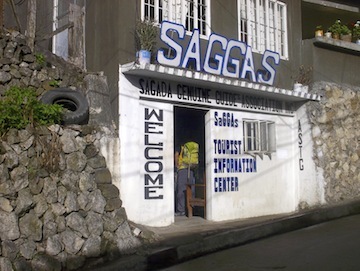 So after spending 12 hours on the most uncomfortable bus I’ve ever been on, we arrived in Sagada. Sagada is a small town in the beautiful mountains of the Northern Philippines, I am told that about 10,000 people live within the various barangays (neighborhoods) there. The area for tourist consist of one main road lined with restaurants and hostels/inn (don’t expect to find any fancy hotel here). Joseph arranged a room at Kanip-aw Pines View Lodge, a hostel/inn at the far end of the town (about a 10 minute walk to the main part of town). Kanip-aw is a nice lodge, it is clean, and has private bathrooms, the small Asian type, all in one no separate shower deal. The owner, Oscar helped with getting a tour guide (meaning your guide will meet you there instead of you having to walk to the SAGGAs office). Kanip-aw Pines View Lodge is built with pinewood so it feels very cozy, with a scenic mountain view. Our first day there we headed to Kimchi for coffee, a nice place to go just chill out. They play reggae music and there are tons of Bob Marley pictures and recycled artsy decorations (bottle caps, plastic, and cigarette containers) you feel as if have been instantaneously teleported to Jamaica! However, they serve Korean Barbecue and Filipino food. While there we decided to go to Yogurt House for lunch, our destination of choice. 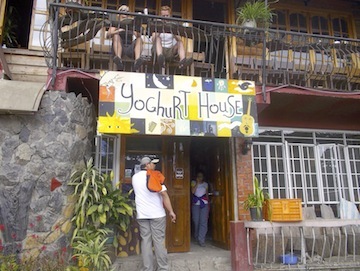 Yogurt House has great food and a warm atmosphere. They have large meals as well as smaller options such as a meat and potato meals, a ham and apple sandwich a triple-decker and of course yogurt! After lunch we went on a site seeing tour with a SAGGAs guide. They offer a choice of three different places. We chose the hiked to Echo Valley including, down to the Echo Valley Hanging Coffins, then a longer hike to Bokong Falls aka Small Falls. 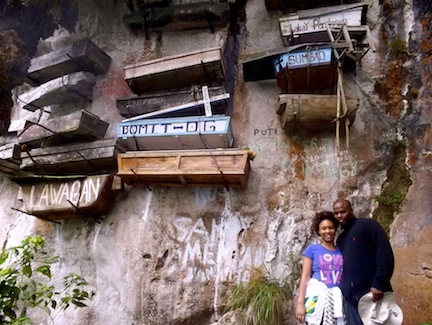 Hiking to Echo Valley is pretty easy, getting down to the coffins is another story- there are some pretty steep and tricky paths, which is all part of the adventure. Remember once you go down you also have to get back up, then hike to Bokong Falls. Bokong Falls is really small but there are rice terraces to view along the way there, I found them most scenic. 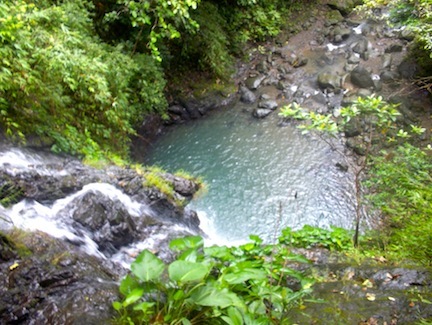 There is also pool that you are welcome to swim in but as you can see I’m wearing jeans and a sweater in my pictures. I was not about to strip down and jump into near freezing water on a cold day. Honestly, Echo Valley and its coffins (for some reason treated as two separate tour destinations) is a good hike and destination but I could have done without the Bokong Falls potion of the tour. Side note: this was our guides second tour, thus he did not have much information. I believe this is because we booked our guide around 2pm – later in the day. Make sure you ask for an experienced guide, others were treated to a more informed and interesting tour. “Chestnuts roasting on an open fire, Jack Frost nipping at your nose,” this is what The Log Cabin felt like. 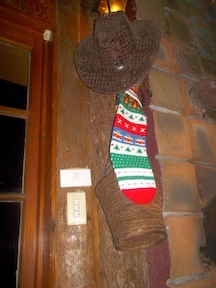 It was a warm and cozy log cabin with a fire-place of course, just what we needed to feel a sense of home at Christmas time. The food was a family style buffet that consisted of pork loin, roasted chicken with string beans, mashed potatoes, glazed carrots, pasta salad, broccoli, a tomato and zucchini dish, dessert, and coffee. ALL DELICIOUS! After dinner we headed back to Kimchi with our new Filipino friends who were part of the group (but not part of the tour like us), to drink a bottle of rice wine and enjoy a snack. On our second day we had a slower start. I was a little sore from the hiking the day before. So we slept in and enjoyed the comfort of our cozy pine lodge. We lunched again at the Yogurt House because when something is good you stick with it. Next we headed to the SAGGAS office to get a guide to go spelunking. This time our guide had over 30 years of experience and a tad bit too talkative! But he knew his way around the cave. 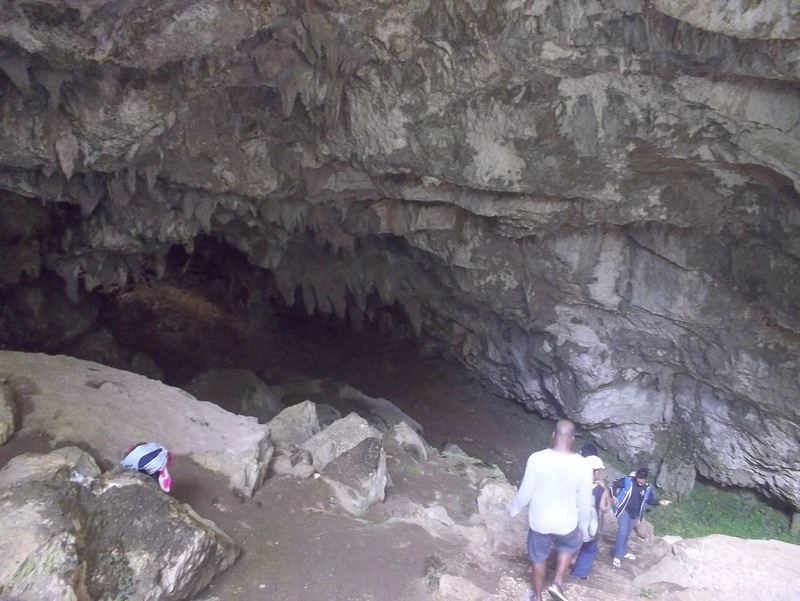 We decided to just do a single cave Sumaging Cave, which takes about 2 -4 hours rather than the cave connection – Lumiang Burial Cave and Sumaging Cave which can take 4 -8 hours. 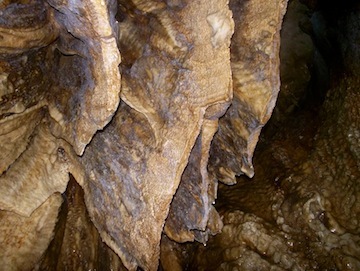 Joseph told us that you don’t see much more in Lumiang Cave, and we really were not up to a possible 8 hour journey. Our guide was nice and took us to the Lumiang Cave entrance to see the coffins and try to get us to do the Cave Connection (more expensive of course). Then the cave said to me “DO NOT ENTER”! Its opening looked like a huge drop into nothingness, just plain scary, ok! 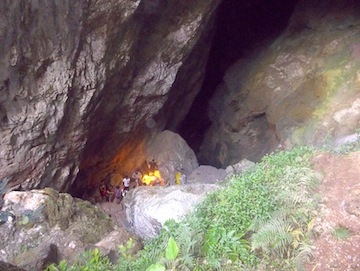 We continued our trek to Sumaging Cave. 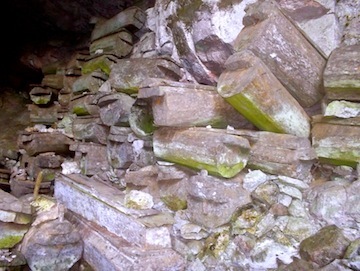 Sumaging Cave is filled with bats, as you know, bats cannot see and they fly very high so you don’t see them above you. But what we could see and feel is the bat sh*t droppings. This made the floor very slippery in the first part of the cave tour. I’m thinking those Five Finger shoes or Teva’s might be the best thing for this situation, flip-flops are the recommended option? I wore Crocs because they have a sling back and would stay on my feet, but then their insides got “muddy” and made it very difficult for me on the climb out. I ended up cleaning off my feet with my tank top. 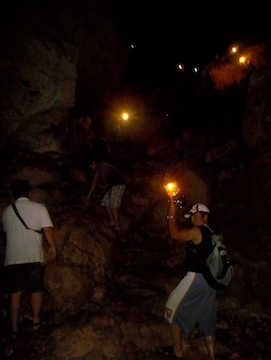 Our guide felt obligated to assist me most of the time, he held an oil lantern in the air in the palm of one hand while climbing and held my hand with his other to help me keep my balance. 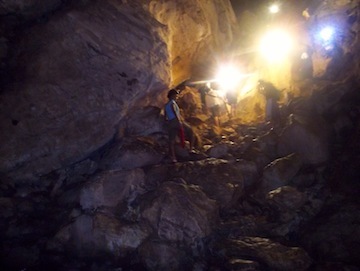 The cave tour has 3 stages; they are muddy, dry then water. Stage 3 is optional and the water is cold but I wanted to go for the full experience so we did all 3 and we didn’t think the water was too cold. 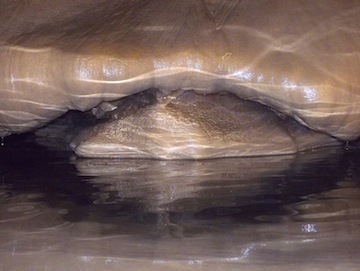 The cave involves rock climbing, sliding, climbing with a rope, and walking in water that is chest deep. Yes, we are brave like that when it involves fun! 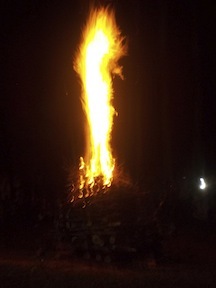 The SAGGAS Bonfire was a nice set up, the entrance was great fun and the bonfire was stack well. The food was a little disorganized but OK. After eating the fried chicken our friends told us that it was Pinikpikan, the Filipino chicken that they beat before it dies- they do this so that it has blood clots throughout the meat so that it tastes better – poor chicken, I could have done without that. The entertainment OK. In the end we all agreed it was a 250 peso ticket to a bonfire and a bonfire it was. I would just suggest they start the bonfire when everyone arrives, then people can enjoy eating around the bonfire. I do believe it was for a worthy cause, the guides don’t get paid much and the guide association is doing its best to help tourism in the area. Our last day in Sagada we decided not to change-up the routine and headed back to Yogurt House yet again. This time we had a breakfast of yogurt and bananas rolled up in a yummy fluffy pancake topped with strawberry preserves; and beef tips with rice and eggs. Get the pancakes! Get the yogurt! 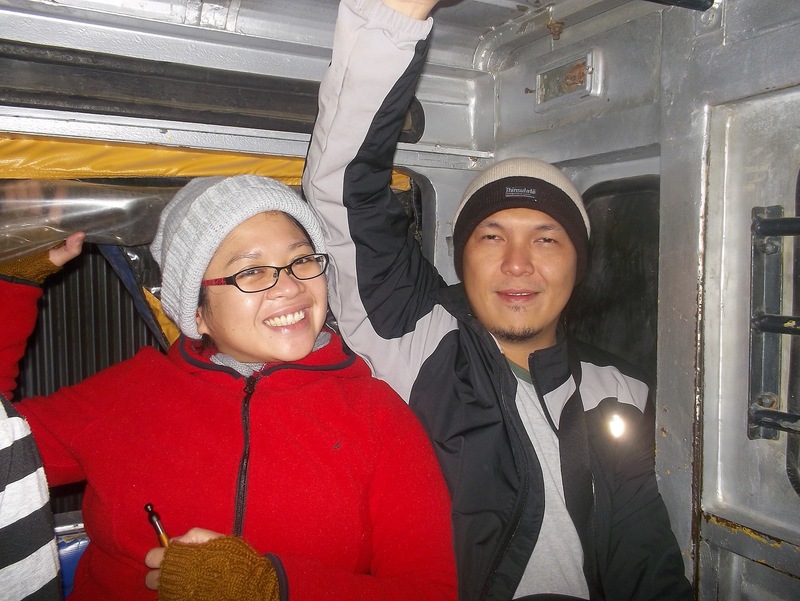 And while you’re at it get the beef tips too =) Then we jumped back in our “fabulous small bus” and were off to Banaue. 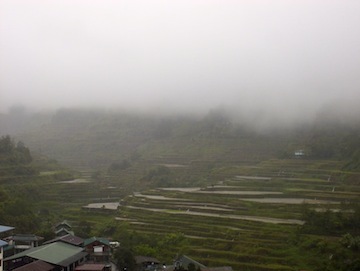 Unfortunately it was raining when we reached Banaue. Our original plan was to stay in Batad overnight which is near Banaue but with all of the spelunking and hiking we really weren’t up for the 1 hour hike in the cold rain to Batad. When we reached there Joseph shouted “zero visibility might as well keep going,” to the bus driver. I was extremely upset, this was a place I originally wanted to stay over and have the full experience of and now this man is saying we aren’t even going to stop. I kept looking out of the window, found a glimpse of the rice terraces, and kindly asked Joseph to have the bus stopped because there was some visibility. He complied and we got off the bus at an alternative lookout point in the rain. 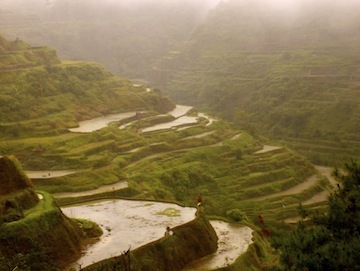 Yes, it was foggy but we got a chance to see and experience the grandness of the Banaue Rice Terrace – which meet many of the UNESCO World Heritage Site qualifications http://whc.unesco.org/en/list/722. 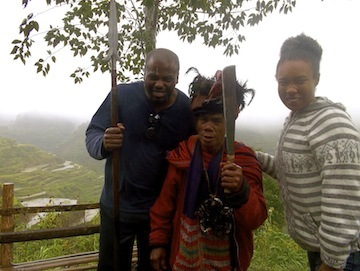 We also had the opportunity to take photos with an Ifugao person who’s’ ancestors built the rice terraces. I am grateful for having had that opportunity of cultural exchange, after all that is what traveling is about! After a short time we were back on the road back to Manila.